Take advantage of this Pradaxa coupon, available only at our Canadian Pharmacy Online! Coupon is applicable on your first order over $50 and coupon codes cannot be combined. One-time use only. Pradaxa (Dabigatran) is an oral anticoagulant, or blood thinner. It works to help prevent the formation of blood clots. It is also used to help prevent strokes in patients with irregular heartbeats. It can also be used after knee or hip replacement surgery to prevent blood clots from forming. Pradaxa works to block the activity of a protein called thrombin which in turn helps prevent the formation of blood clots. This medication is manufactured by Boehringer Ingelheim and is available in the following dosages: Pradaxa (Dabigatran) 75mg, Pradaxa (Dabigatran) 110mg and Pradaxa (Dabigatran) 150mg. It is available in packs of 60 capsules which are sealed in blisters. A typical 3-month supply would be 180 capsules as Pradaxa is often taken twice daily. At PricePro Canadian Pharmacy, you can buy Pradaxa online and get up to 80% off Pradaxa cost compared to your local Pharmacy. For instance, Pradaxa 150mg cost ranges from $90 for 60 capsules to $255 for 180 capsules, plus if you use the Pradaxa coupon you get additional $20 off your first-order. 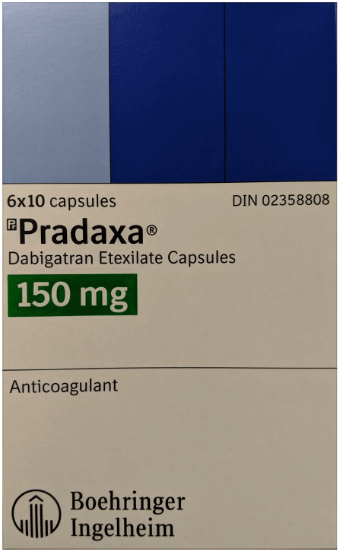 To learn more about Pradaxa (Dabigatran), continue reading read here: Dosage, Side Effects, Warnings & Precautions, and Interactions. Click on the blue boxes for more information. Swallow Pradaxa (Dabigatran) as a whole capsule with a full glass of water. Do not sprinkle capsule contents on food or mixed with liquids. This medicine may be taken with or without food. If an upset stomach occurs while taking Pradaxa (Dabigatran), take it with food or within thirty minutes of eating a meal. If you continue to have an upset stomach, consult your doctor or pharmacist. Continue taking your medication as prescribed unless you are directed otherwise by your doctor. It is important to take this medication every day at the same time. Pradaxa (Dabigatran) taken twice a day should be taken in 12-hour intervals. Dosages will be determined by your doctor and are prescribed based on treatment for your condition. In most cases, you will take oral Pradaxa (Dabigatran) after 5-10 days of treatment with blood thinners through injection. If you suspect a Pradaxa (Dabigatran) overdose, contact your primary care doctor. You may be at an increased risk of bleeding , if you take more Pradaxa (Dabigatran) than prescribed. Do not take two doses at once. If you forget to take a dose and remember before 6 hours of your next dose, take it when you remember. If it is less than 6 hours before your next one, skip the missed dose. Most of Pradaxa (Dabigatran) side effects relate to bruising and bleeding. In rare cases, Pradaxa (Dabigatran) can cause severe bleeding in any part of the body, limit physical abilities and may be fatal. If you fall or suffer an injury while taking Pradaxa (Dabigatran), go to an urgent care to seek medical care. By taking Pradaxa (Dabigatran), you have an increased risk of bleeding. While taking Pradaxa (Dabigatran), your blood work testing your kidney, liver and platelet and red blood cell count may have abnormal results. Consult with your doctor if you are taking Pradaxa (Dabigatran) and experience abnormal blood test results. Do not stop taking Pradaxa (Dabigatran) without the supervision of a doctor. If you stop taking this medication, you have an increased risk for a blood clot. Blood clots can be fatal or cause severe injury. Take Pradaxa (Dabigatran) as directed by your physician to help prevent serious bleeding. In rare cases, an antidote for reversing the effects of Pradaxa (Dabigatran) may be given to help stop severe bleeding or allow emergency surgery. If you are asked to stop taking Pradaxa (Dabigatran) by your doctor, they will inform you when it is time to restart this medication. Use caution while taking Pradaxa (Dabigatran) along with other medications. If you are taking other medications, inform your doctor to avoid interactions with Pradaxa (Dabigatran).